Light-weight Building Systems Inc. will work closely with all consultants, builders and sub-trades to ensure that the building construction meets or exceeds your expectations. We will work closely with site management to schedule our installations and field reviews. A high level of dedication to quality is our priority. Quality is defined as “fitness to purpose” ie. Providing a product (a building) which provides an appropriate quality for the purpose for which it is intended. The price to be paid for a building is a reflection of the expectations of quality; a cheaper building probably uses inferior materials and is likely to be less attractive and less durable. The quality is also related to the timing of when it is delivered. We will remain committed to you, our client. We will manage the quality of our scope from award, through design and construction to the final turnover and warranty period beyond. Determining standards and expectations of the project will be our goal at the award phase. Through providing extensive scope of work information along with estimate concept drawings, Light-weight Building Systems Inc. ™ will commit to fully understanding the level of quality expectations that you, the client, expect on your project. Through the design process, we will work closely with all consultants and client representatives to ensure that the visions of final design by all are met. We will ensure that coordination between all related trades is a priority and we will provide insight through our experience with our determined scope. We have developed extensive field review procedures that ensure conformity with drawings. 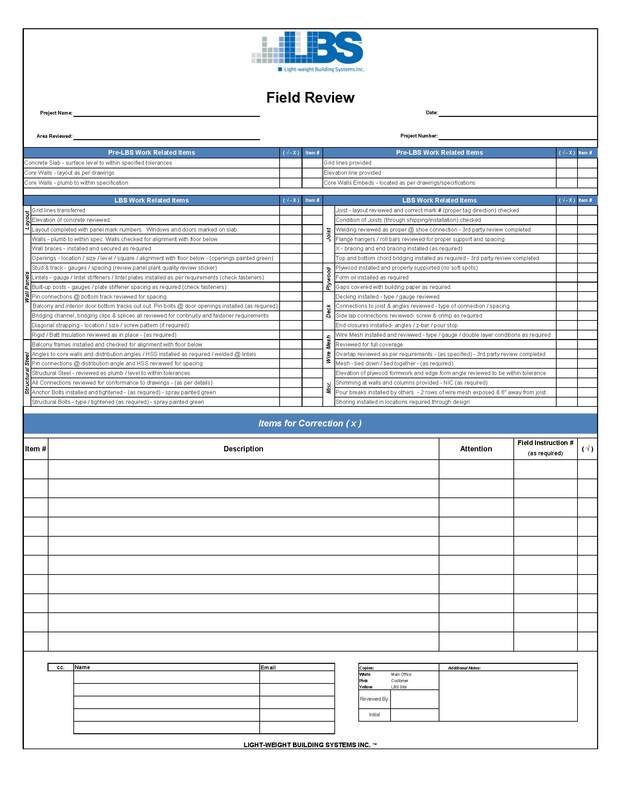 Light-weight Building Systems Inc. ™ will provide copies of all field reports from qualified inspectors during each stage of the building construction. Quality will be our commitment to you. Through the use of our comprehensive quality control program – we will monitor progress and advise of any items of concern prior to work, during work and upon completion. Scheduled site reviews by our independent quality review consultant and approved inspection firms will be maintained through all installations and prior to final turnover.